In the history of turbine-powered aviation, the Germans were the first to fly with the Heinkel 178 (followed by the British Gloster E.28). The Germans were also first with an operational combat aircraft with the Me 262 (followed by the Gloster Meteor). 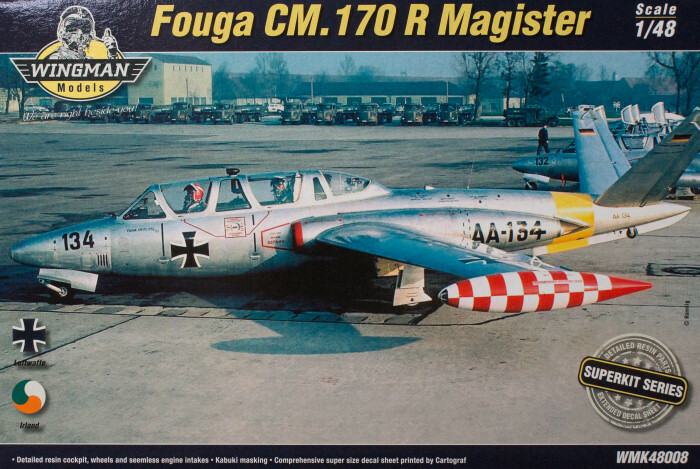 The first purpose-built turbine-powered trainer was the Fokker S.14 Machtrainer, though the first to go into large-scale production was the Fouga CM.170 Magister. To put this into context, the S.14 first flew in 1951, the CM.170 in 1952, the T-37 in 1954, and the T-2 Buckeye in 1958. The Magister entered production 1954 with over 900 examples built. A carrier-capable variant was also produced as the CM.175 Zephyr. The type was produced by Fouga in France and license-built by Heinkel-Messerschmitt in Germany, IAI in Israel, and Valmet in Finland. The Magister has seen military service in at least 25 countries and can be found flying in the warbird community today. These decals are nicely done and include a nice suite of airframe stenciling - painting instructions are provided using RAL numbers. Note that like the Kinetic release, this kit has two complete Magister models in the box, but resin details for only one. You can still build the other kit with the stock parts and use the resin details as a guide should you want to have a similar level of detail in the second model. There are a wide variety of color schemes in this release even though we're looking at the Magisters of two Air Forces. The time periods selected for the Luftwaffe finds the early options in silver and high-visibility colors followed by some transitional color schemes before the adoption of the standard Luftwaffe camouflage in the later examples. Have some fun and give one of these releases a try! My sincere thanks to Wingman Models for this review sample!